Golden-Crowned Kinglets and Hermit Thrushes made up the majority of birds banded in the last half of October, with some White-Throated Sparrows thrown in for variety. There were a few busy days in the netting area, with 96 birds banded on October 16th and a few other days where fifty or sixty birds were captured, but activity in the netting area had slowed considerably by October 25th. 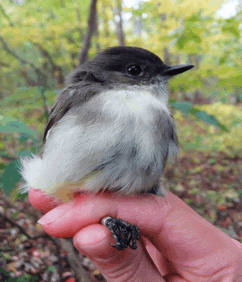 There were a few highlights amid the sea of kinglets, thrushes and sparrows, such as a Blue-Headed Vireo that was banded on October 16th, an Eastern Phoebe turned up in the nets on October 18th, and a very late Yellow-Bellied Flycatcher was captured on October 19th. The most activity was seen on census, largely due to the enormous flocks of Red-Winged Blackbirds, European Starlings, Common Grackles and American Crows that have filled the skies of late, especially over Fox Pond. Outside of the breeding season, these species gather in large roosts at night and congregate in flocks around fields, feedlots, pastures and grasslands during the day. Such groups are often the target of birds of prey, and the flocks of Red-Winged Blackbirds and European Starlings seen over Fox Pond on October 21st were being harassed by a Sharp-Shinned Hawk. American Robins, too, have been a constant over recent weeks. Many have been seen and heard around the netting area, although they remain high up in the trees and are only rarely captured. Although the familiar sight of a robin hopping about on one’s front lawn is considered a sign of spring, many American Robins spend the whole winter on their breeding range, but they are less likely to be seen in the winter, when they spend more time roosting and eating fruits and berries, rather than foraging for earthworms out in the open as they do in the spring and summer. Many American Robins were seen on census on October 20th and 22nd. A Magnolia Warbler was banded on October 16th, and one was seen on October 27th, mixing with a flock of kinglets – an unusually late sighting for Pelee Island! Myrtle Warblers have been seen occasionally, and seventeen were banded on October 19th, but other than that there has been very little warbler activity, as most species have finished their migration for the year. On the lake, the first Common Loon was spotted on October 18th, and Horned Grebes have been seen quite frequently – several hundred were counted on October 24th. The first Common Goldeneye of the season was observed on October 19th, and on October 31st, 200 Scaup species and 440 Red-Breasted Mergansers were counted out on the open water as waterfowl migration picked up pace. A few other firsts remained for the season as well – on October 22nd, the north wind brought with it the first Eastern Bluebirds, Tundra Swans and American Tree-Sparrows of the season. The first Pine Siskins were observed on October 26th, and a Dunlin turned up on census on October 27th. Owl nets were open at the PIBO cottage on Stone Road for the first time this year on October 18th, when PIBO held the first of its annual public owling nights. One Eastern Screech Owl was banded, and is probably a local resident as it was captured again the next week, along with another, unbanded Eastern Screech Owl. The first Northern Saw-Whet Owls of the season were banded on October 26th, and three more were captured on October 29th. Owl banding will continue into November, with two more public owling nights scheduled for November 1st and 8th. We hope to see you there!